One kid was easy. 2 kids got a little harder but when we added the third, things got a little crazy. All of a sudden we were outnumbered. Also being a foster mama, “our third” came in a medically fragile 10 week old bundle, who had to eat every 2.5 hours. I had gotten used to sleeping through the night again, and going back to being up every hour was tough! We had been out of the baby stage for a while as my youngest was 2.5 when our third arrived. It took me a few weeks but I implemented some strategies to make three kids easier. 2. Which leads me to BABYWEAR – this is a necessity in my books. Even if baby wearing is not your thing, find a carrier that works because trust me you will need it. Meals need to get made, laundry needs to get done, playdates need to happen even though you have a new baby. The third will love the extra snuggles, and you will love how easy it is to get things done without having to calm a fussy baby. Lets be honest those wee ones need a lot of snuggles in the beginning! 3. Organize – when bedtime comes just take 15 minutes to get done what you will need to get done for the next morning, whether that is making a school age child’s lunch, setting out the outfits for the kids, packing the diaper bag. Just have all that ready to go because with three kids one is bound to spill their milk all over then, the other won’t be able to find their shoes, and the baby will have a massive blowout just as you are about to get into the VAN. The more organized you are, the easier it will be to tackle any last-minute problems, and maybe just maybe still get you where you need to be on time. 4. Take time for one on one – This became really important to me, because when there was 2 they could easily get one on one with each parent, but now there is always someone left out. Every Sunday afternoon I take one of my daughters out to do something special. The youngest naps, and the other one will have a special one on one time with daddy at home. This is good for me because it gives me time out of the house with just one kid. My kids look forward to it so much and it makes them feel so special. They like to come home and tell their siblings what they did and then the next sibling gets so excited for their “date” the following week. Plus this is my excuse to eat ice cream or go to the movies and have popcorn and not feel guilty haha! 5. Caffeine – I really don’t think this point needs an explanation – I used to hate coffee but now I cannot start my day without one! Sometime I will have tea but when I know it is going to be a challenging day coffee is my go to gasoline to get the morning going. 6. Morning Activity – Whether this is a playdate, or a gym class have something to do right after breakfast, I find this is when my older kids have the most energy so when we drop off our oldest at school, we come home and finish getting ready, and the 3 year olds go to a morning class at our local gym – This is an extra bonus for me because I don’t have to stay with them anymore! Woohoo this give me one on one time with the baby (update: currently “our third” is a sibling set of a 3 year old, and a 20 month old) Having something to do in the morning give the kids something to look forward to and helps to tire them out for nap/rest time. It also helps the day feel like it is dragging on. The days I stay home with my kids all morning seem like the longest. 7. Wake up Early – this doesn’t always happen for me but when it does I always have a better day – I have a shower, put on actual clothes (not yoga pants) and do my hair and makeup. I ALWAYS feel better when I take that time for myself first thing. Most days I go to the gym when the 3-year-olds are at their morning class so I do this all at nap time but just make sure you are not still in your pj’s our comfies when hubby gets home at dinner time. Trust me you feel like you had a much more productive day. If you are a morning person and can get a work out in before the kids are up even better! 8. Get out of the house. 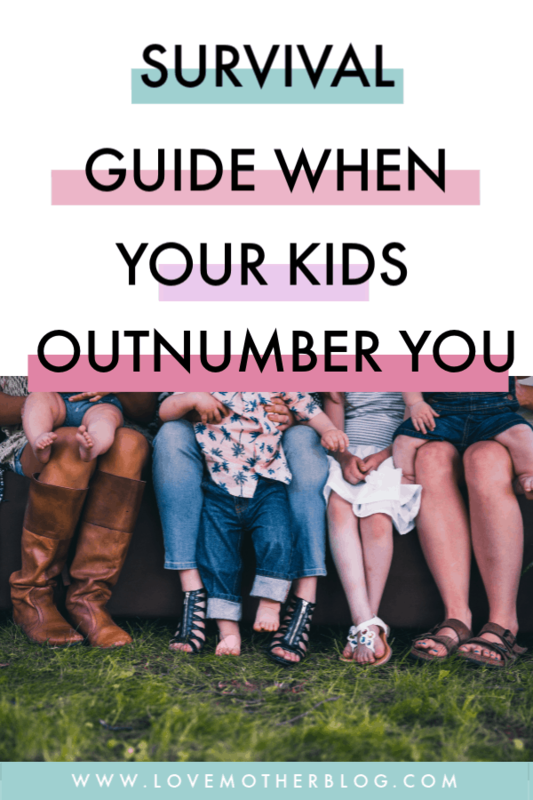 Far too often I hear moms saying that it is too hectic out of the house with three. Go somewhere kid friendly, and just get out of the house. Staying cooped up all day will make you crazy, it will make it hard to see the positives, to just be in your messy house will drive you crazy. Go to a mama friend’s house and get some adult interaction while the kids play. Go to a play place, or park. Strap them in your double stroller, and go walk around the mall. Just get out. It is not good for you to be in all the time. 9. Last but not least. Be Thankful. As hard as some of my days are, and I want to quit this stay at home mom thing, and go back to my job where I could eat, and pee in silence, I wouldn’t change a thing. I love being home with them. I love watching them grow and develop. Seeing them discover the world gives me new fresh eyes and brings me to my knees with gratefulness. Do not focus on the negatives. Try to always focus on the positives and live in the moment. When all else fails just stop the housework and get down on their level and play. You will realize how blessed you are mama. Focusing on gratefulness will make you a much happier mama. My daughters will be 3 and 1 in December. The third is due in late May. I guess I have three baby carriers for a reason 🙂 My oldest lived in her’s when I was a nanny 🙂 We want to adopt a few years down the road, maybe a legally free situation too. Congrats on your third! You house and heart will be so full! That is exciting about adoption! I love to connect with other moms who are interested in adopting! Thanks for stopping in!